That’s because Familiar is about a man who goes through life with a half smile on his face. John Dodd (well-played by Robert Nolan) may seem like your typical suburban father and husband but, whenever he flashes that half-smile, it’s a clue that there’s something much darker going on underneath his facade of normalcy. It’s a smile that feels just slightly forced, something that he uses to keep the world from seeing his true nature. And, for the most part, it works and he succeeds in hiding his true self. But, as the film progresses, that half-smile seems more and more strained as John finds it increasingly difficult to hide his true thoughts. I don’t know whether or not it was an intentional decision on the part of director Richard Powell and actor Robert Nolan, but one thing that struck me about John Dodd was how much he physically resembled a young Dennis Rader. Rader, who was better known as the BTK Killer, was a seemingly normal man who, for over 30 years, murdered innocent people in Wichita, Kansas. When he was finally arrested, he confessed his crimes. Those confessions tend to regularly show up in various true crime documentaries and one thing that always strikes me is just how self-pitying Rader sounds. Even while he’s describing committing countless murders, Rader always seems to be begging his audience to feel sorry for him. The same can be said of John Dodd. Dodd spends the first 12 minutes of Familiar narrating his life to us. He talks about how trapped he feels, living a quiet life with his wife (Astridia Asuza) and teenage daughter (Cathryn Hostick). Even while flashing that half-smile, his thoughts are full of hate and loathing. He can’t wait for his daughter to graduate high school and leave home so that he can finally have some time for himself. And, I will admit that I spent the first half of Familiar thinking that the film itself was going to turn out to be familiar. Don’t get me wrong — it was definitely well-made and directed. I respected the commitment that Robert Nolan showed to playing such a loathsome character. (It takes courage to play someone who you know is going to be hated by everyone in the audience.) But I’ve seen hundred of films about otherwise normal men who are actually sociopathic and, around the time that John was bitterly reflecting on his wife’s depression while still trying to hide behind his increasingly frayed half-smile, I thought I had totally figured Familiar out. But then, suddenly, the film took a turn in a totally different direction from what I was expecting. And I’m not going to tell you too many details about what happened because, ultimately, I want you to watchFamiliar and discover for yourself. So, I’ll just say that the film went from being a semi-satirical look at a madman in the suburbs to being a disturbingly effective portrait of Cronenberg-style body horror, with John’s inner darkness taking on a physical manifestation. And, in doing so, the film forced me to reconsider all of the assumptions that I had previously made about John. It forced me to ask … no, no. I’m not going to spoil the film. It’s available on Amazon and iTunes. Watch it for yourself and find out for yourself what I was forced to ask myself. 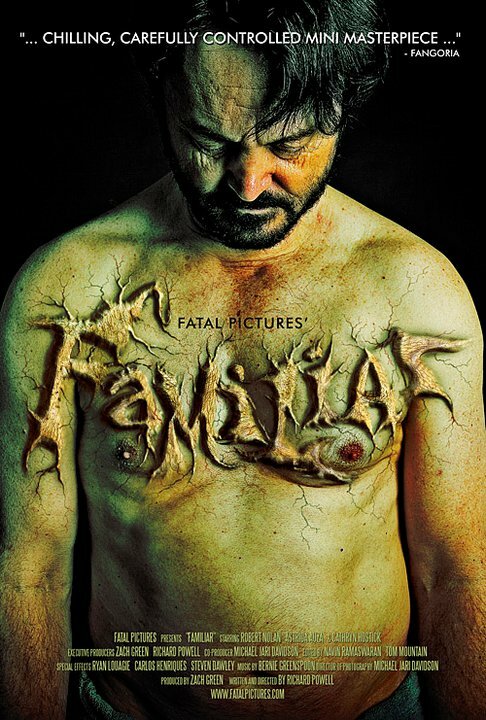 Familiar is a disturbing and thought-provoking look at the monsters who walk among us. Richard Powell’s direction strikes a nightmarish tone from the beginning and then just gets more intense from there. For the first half of the film, Robert Nolan makes John Dodd into an all-too believable monster and then, during the second half of the film, Powell and Nolan tear apart both the character and all of our expectations. In the end, Familiar is a triumph of both suburban satire and visceral horror. Thanks for the fine review of FAMILIAR. It is a wonderful privilege to have acted in this film. 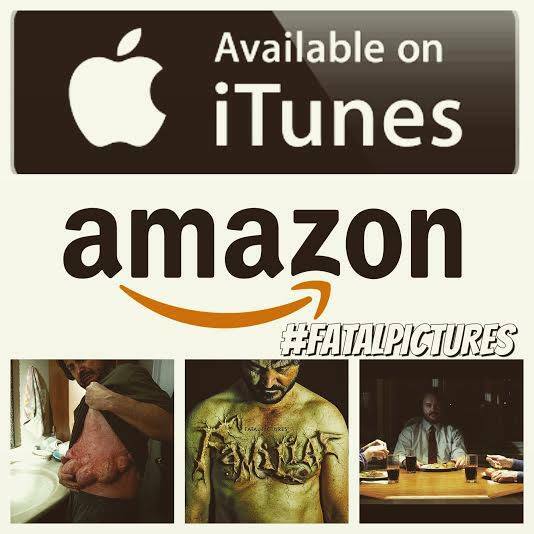 And look for HEIR, the latest horror film from Fatal Pictures starring Bill Oberst Jr., now on the festival circuit!